The Obama administration has stepped up its war inside Syria with air drops of military and medical supplies on Sunday to beleaguered Kurdish forces holding the town of Kobani against a sustained offensive by Islamic State of Iraq and Syria (ISIS) militia. At the same time, the US is putting intense pressure on the Turkish government to assist in preventing Kobani, near the Turkish border, being overrun by ISIS fighters. Lahur Jangi Talabani, director of the intelligence agency of the Kurdish regional government in northern Iraq, told the Guardian that three US military transports delivered 24 tonnes of small arms and ammunition as well as 10 tonnes of medical supplies to Kobani. The Turkish press reported that the US aircraft did not cross Turkish airspace en route from Iraq. Turkey, which has long borders with Syria, Iraq and Iran is the only NATO ally in the Middle East. It has adamantly opposed providing any support for the Kurds against ISIS, revealing deep tensions within the anti-ISIS coalition. Turkey’s air force even carried out strikes on positions in south east Turkey of the outlawed separatist Kurdistan Workers Party (PKK), who were crucial in pushing back ISIS in northern Iraq. The PKK’s affiliate in Syria is the Kurdish Democratic Union Party (PYD), whose armed wing, the YPG, has borne the brunt of the fighting against ISIS in Kobani. The fear in Ankara is that the consolidation of the YPG’s hold in northern Syria will strengthen the PKK’s position inside Turkey, including through the provision of arms. Speaking on Saturday, Turkish President Recep Tayyip Erdogan flatly ruled out facilitating the transfer of American arms to Kobani. “There has been talk of arming the PYD to form a front against ISIS. For us, the PYD is the same as the PKK. It is a terrorist organisation. It would be very, very wrong to expect us to say ‘yes’ to our NATO ally America to give this kind of support. To expect something like this from us is impossible,” he said. Erdogan also continued to insist that US demands for the use of Turkish air bases were contingent on US support for imposing no-fly and buffer zones in Syria and explicitly targeting the Syrian government of President Bashar al-Assad. Turkey, along with other regional allies such as Saudi Arabia and the Gulf States, signed up to the new US war understanding that its main aim was the ouster of Assad. Turkish tensions with the US reflect tactical differences over the timing and means for regime change in Damascus. Nevertheless, within hours of the airdrops, the Turkish government announced that it will allow Kurdish peshmerga fighters from Iraq to transit Turkey to reinforce Syrian Kurds in Kobani. The decision followed a phone conversation between US President Barack Obama and Erdogan in which Obama was said to have described the situation in Kobani as desperate and warned Erdogan of the planned arms drops. Kerry’s comments underscore the utter cynicism behind US support for the YGP and other Kurdish militias. The battle for Kobani presents an opportunity for the US not only to inflict significant losses on ISIS, but potentially to establish a base for US operations inside Syria against the Assad regime. While the PYD and the PKK are still on the US State Department’s list of terrorist organisations, Kerry is rebadging the Syrian Kurds as Washington’s latest “valiant” freedom fighters. 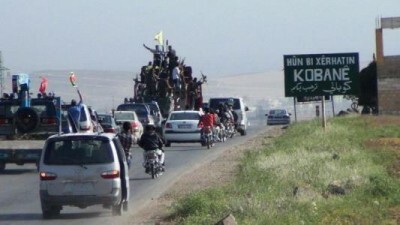 While welcoming the US air drops, the PYD in Kobani greeted the Turkish announcement of peshmerga fighters coming to their relief as “Turkish propaganda.” There are significant divisions between the Turkish and Syrian Kurdish groups, on the one hand, and the Kurdish Regional Government in Iraq, which has forged close ties to Ankara. The Al Jazeera news agency reported that there has been no official decision by Iraq’s Kurdistan Regional Government (KRG) to send its fighters, who are already stretched very thin combating a renewed ISIS offensive. Yesterday, ISIS launched a wave of around 15 near simultaneous attacks on Kurdish peshmerga positions in northern Iraq, including the strategic Mosul Dam. The US is clearly seeking to turn the various Kurdish militias, which have been the only ground forces able to stem ISIS advances, into a reliable proxy force to advance its strategic ambitions in Iraq and Syria. The US State Department held formal direct talks with the PYD just over a week ago. The US is continuing its bombing campaign with 10 strikes in Iraq and 13 in Syria over the weekend. The air attacks in Iraq focussed on the western province of Anbar where ISIS and its Sunni militia allies control large swathes of territory and threaten to encroach on the capital Baghdad. The strikes in Syria were directed predominantly against ISIS positions around Kobani. The sectarian character of the war in Iraq and Syria was underscored by the Iraqi parliament’s approval on Saturday, after a lengthy delay, of Iraqi Prime Minister Haider al-Abadi’s appointees to the key ministerial posts of defence and interior. Under pressure from Washington to include Sunni politicians into his predominantly Shiite government, Abadi nominated Sunni parliamentarian Khalid al-Obeidi as defence minister. However, his appointee as interior minister—Badr Organisation member Mohammed Salem al-Ghabban—is sure to fuel sectarian tensions. The Shiite Badr brigades were notorious for sectarian violence against Sunnis under the US occupation of Iraq. Yesterday four car bombs exploded near two important Shiite shrines in the southern Iraqi city of Karbala, killing 22 people and wounding another 51. Another attack involving a suicide bomber killed at least 18 people and wounded 33 more at a Shiite mosque in Baghdad.